State School Lawyers is a social mobility initiative which highlights the enormous contribution to the legal profession of individuals educated in the state sector. The scheme identifies role models for young people and also arranges classroom visits which allow primary and secondary pupils to meet a lawyer, often for the first time. We feature high profile individuals along with sector specialists and talented young lawyers just starting out. State School Lawyers has been very well received by the legal profession. We are particularly grateful to Baroness Helena Kennedy and Cherie Booth QC for leading the way. We are also very grateful to the Law Society of Scotland as well as our partner organisations and law firms across the UK for their support. 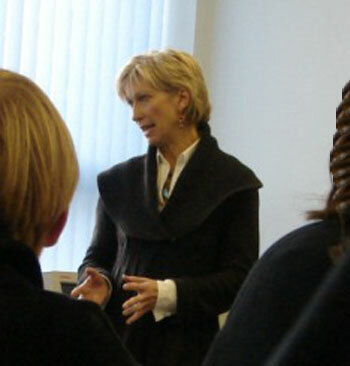 Top corporate lawyer, Lindy Patterson, visited her former high school in the small fishing village of Eyemouth. Lindy’s enjoyable session was warmly welcomed by teaching staff and offered senior students an opportunity to meet and question one of their school’s most prominent former pupils. During the session, Lindy said young people should be encouraged to understand and respect the law. She dealt with a wide range of topics including her own experiences as a pupil, her work as a lawyer and the advice she would offer today’s youngsters. Lindy’s friendly, informal advice was very valuable to the pupils at an important stage in their life. Moreover, as an expert in construction and engineering disputes, she challenged many of the stereotypes commonly held by young people regarding lawyers and the work they do.